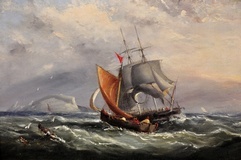 Ebenezer Colls - Landing the Pilot, off the Needles, Isle of Wight, English Channel - Online gallery supplying original fine art. Trending Modern British and Contemporary Welsh. Available for sale from Big Sky Fine Art; this original oil painting by Ebenezer Colls, dating from around 1860. The painting is presented and supplied in its original ornate frame supplied by John Beer Carver and Gilder, 101, Park Street, Camden Town. The painted surfaces have benefitted from some restoration, cleaning and conservation, which took place in 2012 on our instructions. The canvas was originally supplied by John Reeves, Artist Colorman of 2 John Street, Tottenham Court Road. Ebenezer Colls was an English maritime artist who worked and exhibited from London, including at the British Institute. His oil paintings of great ships are highly collectable; two are currently held by the National Maritime Museum at Greenwich. This dramatic nineteenth century oil on canvas depicts a seascape off the Hampshire & Dorset coast where The Solent meets the English Channel. The seas are rough with a heavy swell and a sailing vessel with white sails is being tended to by a smaller pilot boat, which has a red sail. The crew of both vessels can be seen, with further men in the water, clinging to rigging that has been lost to the sea. There are seagulls flying overhead, and the distinctive white cliffs of the Needles are in the background.